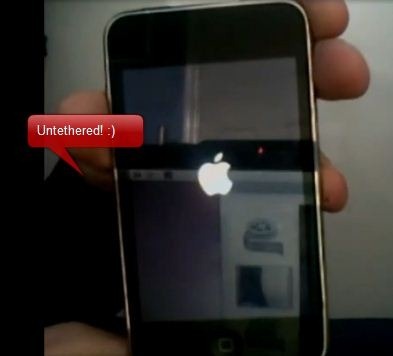 Untethered iPhone 3.1.3 Jailbreak Release on April 12? A new team of hackers by the name “TheiPhoneDevTeam” have come up with a video, which shows iPhone 3.1.3 untethered jailbreak for all the iDevices which includes MC models of iPod touch and iPhone. The video which you can see below completely follows all the video guidelines laid down by MuscleNerd of iPhone Dev-Team. The official description of the video is as follows. Jailbreak for iPod Touch 1g / 2g / 3g MC , iPhone 2g / 3g / 3gs MC (And yes, iPad is supported, new video showing Jailbroken iPad will be uploaded in late april when it gets delivered!) Jailbreak Development process took 3 weeks from exploit to fully functional program. Program jailbreaks your idevice in about 3 minutes i will upload a update to try and shorten the process in the next few days. The hackers claim that their software can jailbreak all the iDevices in about 3 minutes, and that you can expect them to release it on 12th April. TheiPhoneDevTeam Im expecting﻿ to release before Monday 12th after final testing. Even though the video follows all the guidelines, it still could be fake. Maybe they just want to pressurize geohot or the iPhone Dev-Team to release their respective version of untethered jailbreaking tools? Fake or not, we will know it soon as April 12th isn’t too far off. UPDATE 1: So as it turned out, MuscleNerd of iPhone Dev-Team has declared this one as fake. Fake…check out Sec 0:40 – 0:41 in the video…..there's a cut…. Sorry for my bad English!!!!!!!!! i bought also an iphone 3gs but i am not sure if this one has the old baseband or the new one… i tried to jb with blackrain but it is not working… thats why i think i have fw 3.1.3, but how to learn which baseband do i have in my iphone 3gs…??? can any one help me about that??? Just another way of getting our hopes up for a release then kick us back down at the last minute. They will probably say they can't release it now and we will have to wait. THEY NEED TO RELEASE IT SOON! its the light source changing because of a close up! i think as soon as you read a thread like this you know its not going to happen , but there is that little bit of hope that you cling on too !!! I am going to go with fake, but one can wish. But they still have 12 more hours. where would I go to get it if the jailbreak was real and it did come out? 1.) get an original simcard of the carrier the iPhone is locked to and insert it. You just need to insert it for about 5 Minutes and the iPhone will activate. There won't be any costs for the guy who lend you that card. But this all won't fix one thing: you CANT jailbreak or unlock it yet. Maybe at the end of the month, but now you can only use the iPhone without the telephone, sms, 3g option and without a jailbreak. I read most of the discssions on the thread above. I am In India..and i accidently upgraded the version to 3.1.3 (as most of us do) and now it is locked. when can we expect the crack to come on the web. its been more thann 2 months that apple has launched the new upgrade, but the crack is no where. Any specific timelines that you know. thanx in advance and have a great day..! !